ملک زاده فرد, کرامت, رضائی حسن آبادی, محسن. (1393). تحلیل ارتعاشات آزاد و خمش استاتیکی ورق ساندویچی انحنادار با وجود لایه روغن هوشمند مغناطیسی در رویه‌ها با استفاده از تئوری مرتبه بالای بهبودیافته‌ی ورق‌های ساندویچی. 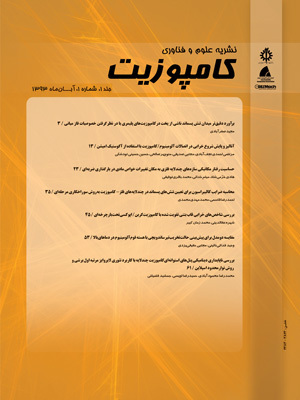 علوم و فناوری کامپوزیت, 1(2), 49-62. کرامت ملک زاده فرد; محسن رضائی حسن آبادی. "تحلیل ارتعاشات آزاد و خمش استاتیکی ورق ساندویچی انحنادار با وجود لایه روغن هوشمند مغناطیسی در رویه‌ها با استفاده از تئوری مرتبه بالای بهبودیافته‌ی ورق‌های ساندویچی". علوم و فناوری کامپوزیت, 1, 2, 1393, 49-62. ملک زاده فرد, کرامت, رضائی حسن آبادی, محسن. (1393). 'تحلیل ارتعاشات آزاد و خمش استاتیکی ورق ساندویچی انحنادار با وجود لایه روغن هوشمند مغناطیسی در رویه‌ها با استفاده از تئوری مرتبه بالای بهبودیافته‌ی ورق‌های ساندویچی', علوم و فناوری کامپوزیت, 1(2), pp. 49-62. ملک زاده فرد, کرامت, رضائی حسن آبادی, محسن. تحلیل ارتعاشات آزاد و خمش استاتیکی ورق ساندویچی انحنادار با وجود لایه روغن هوشمند مغناطیسی در رویه‌ها با استفاده از تئوری مرتبه بالای بهبودیافته‌ی ورق‌های ساندویچی. علوم و فناوری کامپوزیت, 1393; 1(2): 49-62. در این تحقیق به‌تحلیل ارتعاشات آزاد و خمش استاتیکی ورق ساندویچی انحنادار با وجود لایه روغن هوشمند مغناطیسی در رویه‌ها پرداخته شده است. ورق ساندویچی مورد بررسی دارای شرایط تکیه‌گاهی ساده بوده و تحت بارگذاری خمشی می‌باشد. برای استخراج معادلات حرکت حاکم بر سیستم، برای اولین بار از تئوری مرتبه بالای بهبود یافته‌ی ورق‌های ساندویچی و اصل همیلتون برای ورق ساندویچی دوانحنایی تحت بارگذاری خمشی با لایه روغن هوشمند در رویه‌ها استفاده شده است. سپس، بعد از مقایسه با نتایج مشابه موجود در حیطه‌ی این موضوع و اطمینان از صحت معادلات استخراج شده، اثرات شدت میدان مغناطیسی و پارامتر‌های هندسی مثل ضخامت هسته، ضریب منظری ورق، شعاع انحنا و موارد دیگر بر مشخصه‌های ارتعاشی و خیز ورق مورد بررسی قرار گرفته است. در بخش ارتعاشات آزاد مشاهده شده که فرکانس طبیعی ورق با افزایش شدت میدان مغناطیسی و ضریب منظری افزایش و با افزایش نسبت ضخامت هسته به ضخامت کل ورق کاهش پیدا می‌کند. همچنین مشاهده شده، فرکانس‌های طبیعی ورق برای حالت دو انحنایی بیشتر از حالت‌های تک انحنایی و تخت می‌باشد. در بخش تحلیل خمش استاتیکی نیز مشاهده شده است که با افزایش نسبت ضخامت هسته به ضخامت ورق، و با افزایش نسبت شعاع‌های انحنا خیز ورق افزایش، و با افزایش شدت میدان مغناطیسی،‌ خیز ورق کاهش می‌یابد. بنابراین می‌توان با تغییر این پارامترها، فرکانس طبیعی و خیز سیستم را در محدوده‌ی مورد نظر حاصل نمود و همچنین با داشتن یک میدان مغناطیسی قابل کنترل در سیستم، می‌توان فرکانس طبیعی و خیز سیستم را کنترل نمود. In this study, free vibration and static bending analysis of curved sandwich panel with magneto-rheological (MR) fluid layer in sheets have been studied. Sandwich panel that is studied is double curved with simply support boundary condition and it is under bending load. In order to derive the governing equations of motion, an improved high order sandwich panel theory and Hamilton's principle are used for the first time. After comparing with similar results in the domain of this issue and ensure that the accuracy of the derived equations, the effect of magnetic field on the frequency of the panel has been investigated. The effects of magnetic field intensity and changing the geometric parameters such as aspect ratio, thickness of MR layer, radius of curvature and thickness ratio on the characteristics of vibration and deflection have been studied. In the free vibration analysis section, the obtained results showed that the natural frequency of panel increases by increasing the magnetic field, also increases by increasing the panel aspect ratio, and decreases by increasing the core thickness to panel thickness ratio. Likewise the obtained results showed that the natural frequenciy for the case of double curved panel is more than single curved and flat panel. In the static bending analysis section, obtained results showed that the natural deflection of the panel decreases by increasing the magnetic field, increases by increasing the radiuses of curvatures ratio, and increases by increasing the core thickness to panel thickness ratio. Therefore, by changing these parameters, the natural frequency and deflection of the system, can be changed in the desired range, and also by having a controllable magnetic field in the system, the natural frequency and deflection of the system can be controlled. Reddy, J. N. "Mechanics of Laminated Composite Plates and Shells", Theory and Analysis. 2nd Edition, CRC Press, New york, 2004. J. L, Donald, “Engeneering ana;ysis of smart materials systems”. s.l. John Wiley & Sons Inc., 2007. Rahmani, O. Khalili, S.M.R. Malekzadeh, K. Hadavini, H., “Free vibration analysis of sandwich structures with a flexible functionally graded syntactic core”, Composite Structures, Vol. 91, No. 2, pp. 229-235, 2009. Rahmani, O. Khalili, S.M.R. Malekzadeh, K., “Free vibration response of composite sandwich cylindrical shell with flexible core”, Composite Structures, Vol. 92, No. 5, pp. 1269–1281, 2010. Kheirikhah, M.M. Khalili, S.M.R. Malekzadeh Fard, K., “Biaxial buckling analysis of soft-core composite sandwich plates using improved high-order theory”, European Journal of Mechanics - A/Solids, Vol. 31, No. 1, pp. 54–66, 2012. Viola, E. Tornabene, F. Fantuzzi, N., “General higher-order shear deformation theories for the free vibration analysis of completely doubly-curved laminated shells and panels”, Composite Structures, Vol. 95, pp. 639-666, 2013. Rajamohan, V. Sedaghati, R. Rakheja, S., “Vibration analysis of a multi-layer beam containing magnetorheological fluid”, Smart Mater. Struct., Vol. 19, pp. 1-12, 2010. Rajamohan, V. Rakheja, S. Sedaghati. R., “Vibration analysis of a partially treated multi-layer beam with magnetorheological fluid”, Journal of Sound and Vibration, Vol. 329, pp. 3451–3469, 2010. Lara-Prieto, V., “Vibration characteristics of MR cantilever sandwich beams: experimental study”, Smart Mater. Struct., Vol. 19, 2010. Frostig, Y. Thomsen, O.T., “High-order free vibration of sandwich panels with a flexible core”, International Journal Solids Structures, Vol. 41, pp. 1697–1724, 2004. Sun, Q. Zhou, J. X. Zhang, L., “An Adaptive Beam Model and Dynamic Characteristics of Magnetorheological Materials”, Journal of Sound and Vibration, Vol. 261, pp. 465–481, 2003. Reddy, J.N., “A refined nonlinear theory of plates with transverse shear deformation”, International Journal Solids Structures, Vol. 20, pp. 881–896, 1987. Whitney, J. M., “Shear correction factors for orthotropic laminates under static load”, Journal of Applied Mechanics, Vol. 40, pp. 302-304, 1973. Reddy, J.N., “Energy and variational methods in applied mechanics, First Edition”, New York: John Wiley, 1984. Sanders. J.L., “An improved first approximation theory for thin shells”, NASA THR24, 1959. Reddy, J.N., “Mechanics of Laminated Composite Plates and Shells, Theory and Analysis”, Second Edition, New york: CRC Press, 2004. Biglari, H. Jafari, A.A., “High-order free vibrations of doubly-curved sandwich panels with flexible core based on a refined three-layered theory”, Composite Structures, Vol. 92, pp. 2685-3694, 2010. Asgari, M. “Optimum design of composite sandwich panels with Magneto-Rheological fluid layer using new high order theory”, MSc Thesis, K. N. Toosi University of Technology, Iran, 2010.